Summary: Batch files are a hold-over from the days of DOS, but they still provide some great features in the lastest versions of Windows. Understanding and Using Batch Files is your guide to everything related to creating and using your own batch files. Those who have been around personal computers for years and years have probably heard about batch files. A batch file is nothing but a series of commands, stored in a text file, that are designed to be executed on what used to be called the DOS command line. (These days—since the advent of Windows—it isn't "normal" to talk about the DOS command line. Instead, we talk about the command line within a command window.) The text file can, itself, be executed from the command line, with each command in the file being executed as if you had typed it yourself. Batch files have been around since the earliest days of DOS. I remember running batch files on my first IBM PC, way back in the early 1980s. Once Windows came onto the scene and started really taking off (in 1990), it became inevitable that batch files would become a relic largely of the past, relegated to geeks who still liked to do things in the command window. Even so, batch files have remained available—albeit behind the scenes—in all the versions of Windows ever released. They provide a very powerful way of accomplishing tasks that may take much longer to do if you simply rely on the Windows interface. The Understanding and Using Batch Files e-book introduces you to the power still available in batch files, even in the latest versions of Windows. Whether you are familiar with batch files or entirely new to the entire concept, you'll find this e-book to be a great help in discovering how to use this powerful feature that is hidden in the background of your system. Here you'll find a wealth of information that can help you start using batch files to do your own work more efficiently than you may have thought possible. The ability to view, search, and print the book. Screen shots that illustrate what you see in Word as you follow the step-by-step instructions. The ability to select and copy sections of text, such as macro code. Hyperlinks to internal content (in the book itself) and referenced resources on the Web. To use the Microsoft Word version of the e-book, you just need Microsoft Word installed on your system. If you want to use the Adobe Acrobat (PDF) version, you need to either have Acrobat or the free Adobe Acrobat Reader. Many computer systems already have the reader installed. If you do not, you can get it free, directly from Adobe. To get an idea of the hidden knowledge packed into Understanding and Using Batch Files, take a look at the complete table of contents. Understanding and Using Batch Files provides a valuable resource for focused information that can't be matched by any other single source or computer book. How much does this valuable resource cost you? 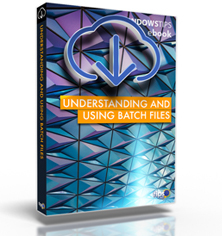 You can download your own copy of Understanding and Using Batch Files for the low price of only $24.99. Place your order today! You can also order Understanding and Using Batch Files by calling our order line: 307-200-0450.